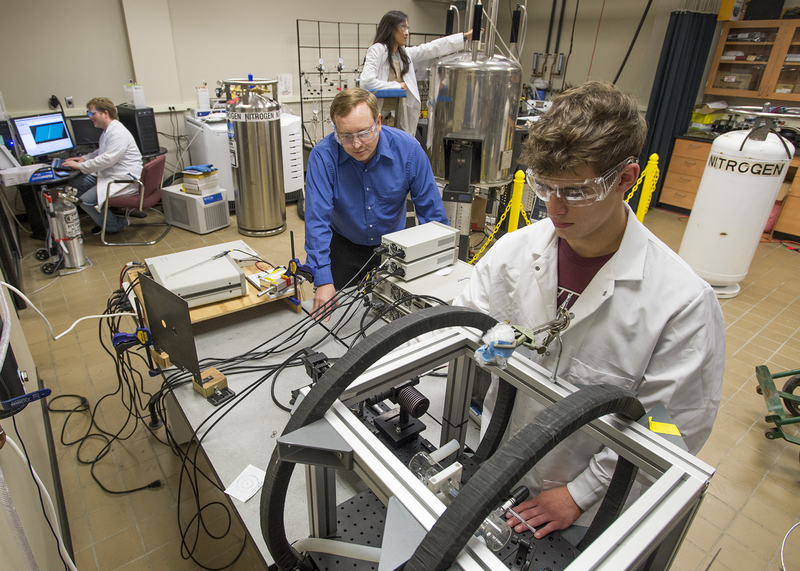 A researcher at Southern Illinois University Carbondale is squarely in the latter camp with his work in the field of hyperpolarization, which holds great promise for vastly more powerful imaging technology. Such techniques could make it possible for doctors to see not only what’s inside the body, such as bones and organs, but how the physiology is working at the molecular level. Boyd Goodson, professor of chemistry and biochemistry in the College of Science, has worked for years in the hyperpolarization field. Hyperpolarization refers to the many techniques available that will effectively magnetize nuclei in the body’s molecules much more highly than if they are magnetized by just a powerful magnet, such as in a magnetic resonance imaging machine, or MRI. When hyperpolarization is achieved, it effectively “lights up” the molecules, making them easier to image with currently available imaging technology. While hyperpolarization techniques exist, scientists and engineers continue working on ways to make them effective in today’s imaging machines. Overall, the effort seeks to make modern diagnostic imaging technologies, such as magnetic resonance imaging, much more sensitive. Goodson has led or been a team member in scores of efforts funded by prestigious scientific organizations including the National Science Foundation and the National Institutes of Health, among others. His current work is funded by the NIH, NSF and the U.S. Department of Defense. Working in a lab populated by students and high-tech equipment at the James Neckers Building, Goodson paused to proudly point out a decidedly low-tech contraption that one of his students recently put together to efficiently and cheaply manufacture parahydrogen gas, which they use in hyperpolarization technique, while discussing his ongoing research. “Much of my work all kind of falls under molecular imaging, a phrase that makes it sound like you’re imaging molecules,” he said. “But to a doctor in the medical field, it means getting images from otherwise conventional radiology with information on the molecular level. To understand further where Goodson’s work fits into the current state of imaging science, one must become familiar with the standard technologies used now. For instance, most people are familiar with the MRI, or magnetic resonance imaging machines. An MRI will show doctors pictures of anatomy inside the body, such as bones and organs and other structures. Some MRI machines can also perform localized spectroscopy – that is, analysis of the chemicals and molecules that are present in certain tissues. To do this, the machine uses another technology known as nuclear magnetic resonance, or NMR. Another technology, and the one that currently comes closest to what Goodson and others are trying to achieve, is the PET scan. Short for “positron emission tomography,” patients undergoing a PET scan ingest or are injected with a modified sugar with a radioactive atom attached to it. The atom emits a positron as it decays. The positron then reacts with an electron in the body – its antiparticle – sending out gamma rays in opposite directions when it does so and creating a signal that the machine can read. “The idea is that you’ll have differential uptake of that compound in cancerous tissue versus non-cancerous tissue because cancer cells are ‘hungrier,’ and the metabolism is different,” Goodson said. Pairing PET technology with X-ray computed tomography or computerized axial tomography scans – CT or CAT scans – can show the actual location of such signals relative to the person’s body. Those technologies, alone or used together, can tell doctors much about a person’s condition. But to achieve what those working in hyperpolarization are after, it’s not good enough. “It comes down to sensitivity, that’s the biggest issue. Detection sensitivity,” Goodson said. Goodson explained that the body mostly is made up of molecules that contain multiple hydrogen atoms – essentially water and fats. For MRI, the signals that make images come from the relatively weak magnetism of the atomic nuclei. In successful hyperpolarization, for example, an MRI might be able to see organ function or study metabolism, including pathological metabolism. And unlike PET scan technology, doctors could do it without exposing patients to ionizing radiation, so that scans could safely be repeated more often. Theoretically, health care workers could tune the polarization to look for specific pathologies with higher spatial resolution. Doctors possibly use such an approach to more quickly investigate how a patient is responding to a given treatment. Another advantage is because the hyperpolarization does not come from the magnet itself, the bulky, expensive and confining large magnets used in MRI would not be necessary. This could lead to imaging that is cheaper, faster and easier for patients. Goodson and his students are investigating ways to hyperpolarize different nuclei by exploiting their natural “spin” characteristics. The term “spin” derives its names from a magnetic property that the subatomic particles, which in many ways resembles the behavior of a classically spinning object. The tiny particles typically possess this spin property in one of two directions, which scientists sometimes term "spin up" or "spin down." Goodson said the spin makes the nuclei of certain atoms, including hydrogen, Carbon 13, Nitrogen 15 and Xenon 129 among others, makes them act like tiny compasses or bar magnets when placed in a magnetic field, with the spins aligning either “up” with the magnet or “down” against it. Goodson and his students are experimenting with different techniques – using high-powered lasers and chemically based “spin transfer” phenomena involving parahydrogen – to hyperpolarize them, which essentially greatly magnifies this characteristic. “The problem is detecting any one spin is virtually impossible, so you need to detect them in bulk for an added-up response so that there is enough signal,” he said. Even in a very strong magnet, the numbers of ‘up’ and ‘down’ spins are nearly equal, so the bulk magnetic response the nuclear spins almost perfectly cancel each other out. This means the “normal” signal in an MRI comes from the tiny residual magnetization of what’s left over. “It’s all about lighting it up,” he said.